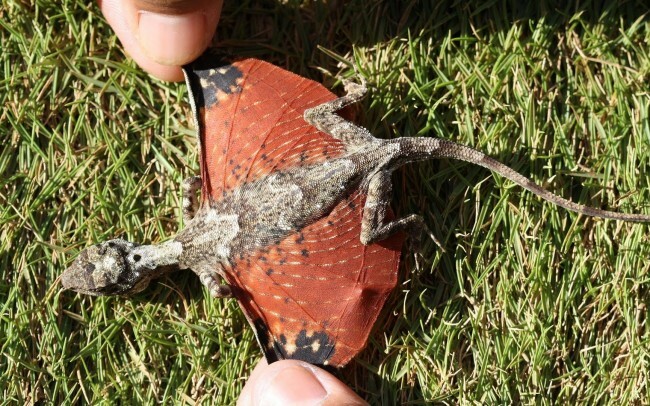 As it turns out, dragons do exist. Well, these little guys technically arent dragons, but they are flying lizards, which seems pretty close. 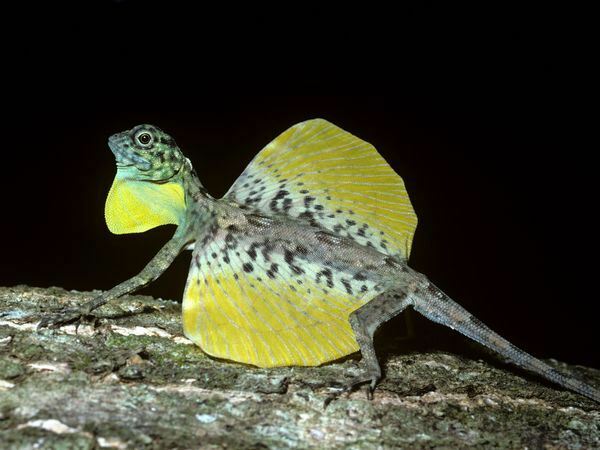 The tiny lizards are known as Draco volans, and over the course of thousands of years, they developed an amazing way to evade predators: Flight. Their small, wing-like appendages allow them to soar from tree to tree in order to escape from predators, find insects, and attract potential mates. Ultimately, they have the ability to soar more than 30 feet (about 9 meters) in one go. Their wings are rather different than your average birds wings, as they are actually a set of elongated ribs, which they can extend and retract on command. Fortunately, we dont need to worry about them pillaging any towns any time soon (Smaug, anyone?). Dracos only reach about 8 inches (20 centimeters) long. Also, they dont breath fire (alas). However, in spite of their size (and their lack of fire breathing), they are rather territorial. Most dracos have territories that consist of about three trees. And in these small spaces dracos spend almost their entire lives. It is where they find their food and their mates. It is where they live and, generally, where they die; however, its not where they are born. In order to lay their eggs, females must take to the ground. To keep their eggs safe, female dracos use their pointed snouts to dig a hole in the earth. Strangely enough, the lizard will stay on the ground to protect its eggs, but only for 24 hours. After this point, they return to the trees and leave their offspring to whatever their fates may be.